Top bosses including Sir Richard Branson, the Premier League chair and car industry executives have backed Remain ahead of Thursday's EU vote. 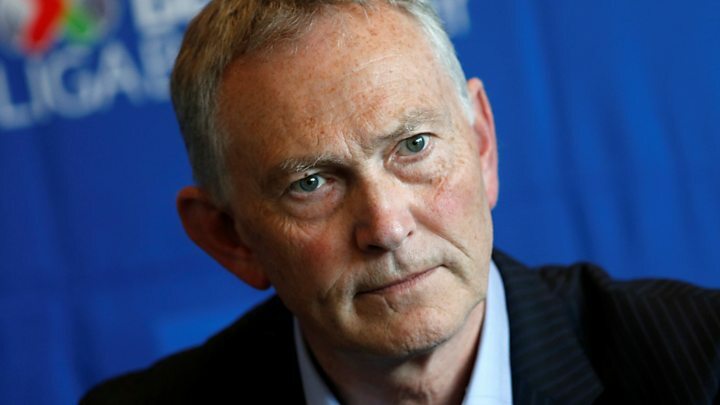 Premier League chair Richard Scudamore said the 20 clubs in the top tier wanted to remain and that leaving would be "incongruous" in the context of the league's commitment to "openness". Meanwhile, Sir Richard warned a British exit from the EU would be "devastating" for the UK's long-term prosperity. Vote Leave rejected the comments. John Longworth, chair of Vote Leave business council, said the UK would be better off outside the EU. "The single market isn't a nirvana, it's a mirage. The single market's a protectionist area. "[Under Brexit] We'd be able to remove the external barriers, reduce the cost of clothing and footwear. Reduce the cost of food products we can't produce in the UK because at the moment the EU puts tariffs up to the rest of the world which we have to pay for," he told the BBC's Today programme. But the car industry trade body, the Society of Motor Manufacturers and Traders' (SMMT), warned leaving the EU would increase costs and threaten jobs. "Remaining will allow the UK to retain the influence on which the unique and successful UK automotive sector depends," said chief executive Mike Hawes. Directors at Toyota UK, Vauxhall, Jaguar Land Rover and BMW, as well as from component makers GKN and Magal Engineering, also voiced their support. Rory Harvey, chairman of Vauxhall, said: "We are part of a fully integrated European company where we benefit from the free movement of goods and people. We believe not to be part of the EU would be undesirable for our business and the sector as a whole." Meanwhile, Premier League boss Mr Scudamore told BBC Radio 5 live that leaving would be "incongruous" in the context of the league's commitment to "openness". "There is an openness about the Premier League which I think it would be completely incongruous if we were to take the opposite position," he said. Media captionSir Richard Branson tells the BBC why he is backing Remain in the EU referendum. Sir Richard Branson, who has long backed the Remain campaign, wrote an open letter, recalling how difficult it was for businesses to operate effectively before the EU, adding he was "saddened" at the prospect of returning to those days. "I'm very fearful that if Britain loses the market of 500 million people that it will be catastrophic for Britain. "I think we'll find the pound will plummet, stocks markets will collapse and that will inevitably have a knock-on effect on pensions, a knock-on effect on jobs so I'm hoping that sense will prevail on Thursday," he told the BBC. And drinks giant Diageo's chief executive Ivan Menezes wrote to the company's 4,773 UK employees, telling them that it would be "better for the UK, better for Diageo and better for the Scotch whisky industry that we remain in". Mr Menezes said Diageo benefited from ease of access to the European single market, as well as trade deals that the EU had negotiated with the rest of the world. "The EU has so far concluded, or is negotiating, over 50 of these global agreements, many of which provide significant commercial benefits for Diageo," Mr Menezes said in his letter. Negotiating new deals after a Brexit could take years, he said. The Leave camp has rejected claims by those supporting Remain. On the Premier League, Vote Leave argued Britain's exit from the EU could shore up more funds to be invested in grassroots sports. "EU rules hurt both our ability to develop home grown talent and restrict access to the global talent pool. "That's the worst of both worlds for football fans and the teams they support," said Vote Leave's Robert Oxley. The group also dismissed Sir Richard Branson's and drinks giant Diageo boss Mr Menezes' proclamations of support for Remain, claiming they had already voiced pro-EU support and the latest comments were no surprise. Vote Leave group's chief executive, Matthew Elliott, also rejected the idea that leaving would hurt the car industry, instead saying it could help exports. "We know that British car exports are increasingly going to the rest of the world, not the EU. As such, a vote to leave could provide a boost to the industry as we would be free to sign free trade agreements with emerging markets - something we are currently forbidden from doing by the EU." He also pointed out that many car company executives had urged Britain to join the euro. "They were wrong then and they are wrong now," Mr Elliott added. Image caption JCB chairman Lord Bamford says he is "very confident that we can stand on our own two feet"
As Thursday's Referendum approaches, executives have recently stepped up support for the Leave and Remain camps. On Sunday, the chief executive of energy giant EDF Energy, Vincent de Rivaz, wrote to his UK staff outlining what he says are the benefits of continued EU membership. Earlier this month Lord Bamford, chairman of JCB, one of Britain's most successful manufacturers, wrote to his company's 6,500 employees in the UK to explain why he favours a vote to leave the European Union. Last weekend, entrepreneur Sir James Dyson told the Daily Telegraph Britain would gain more from leaving the EU than it would lose. Last week, BT bosses and union leaders came out in favour of the Remain camp. Big business and financial firms have generally been in favour of staying in the EU, although surveys suggest that small businesses are more evenly split. Last week, a poll by the Federation of Small Businesses suggested that 42% of members "could still be swayed on how to vote" with 52% "saying they didn't feel they had the information they needed".